Self Made Man Man Made Land is a construction project built by two dancers and a musician. Their materials are movement, voice, and live recording. Relying on dynamic tensions between them, the three raise a structure together. This new work was created by Ursula Eagly in collaboration with dancer Abby Block and composer Kohji Setoh. Ursula Eagly makes bizarre performances full of darkness, humor, and other contradictions. 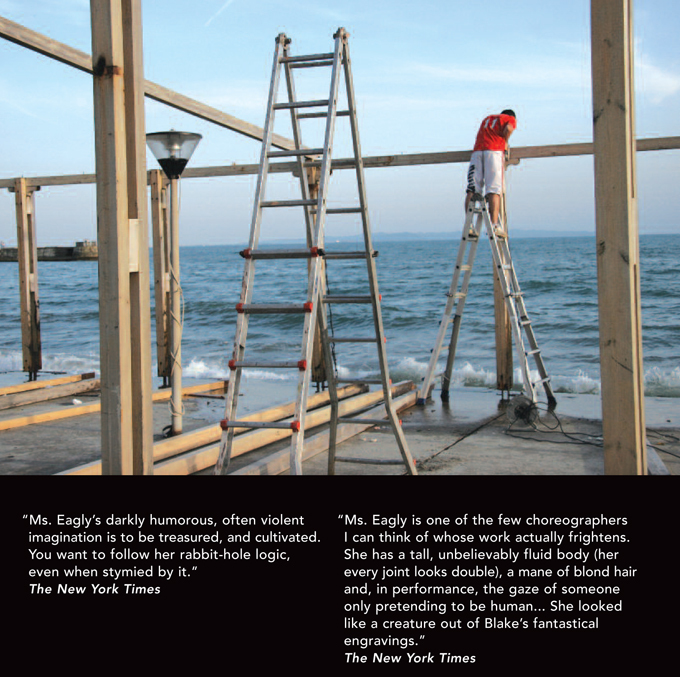 Her work has been commissioned and presented by Dance Theater Workshop, Danspace Project, Dance New Amsterdam, and The Chocolate Factory Theater among others, and has toured internationally to Albania, Italy, and Macedonia. Kohji Setoh’s Elegy for Graveyards and Ursula Eagly’s Self Made Man Man Made Land are supported by the Japan Foundation through the Performing Arts JAPAN program.